Well our last night in Lucerne has now arrived and we are very sad to be leaving. Wendelin and Pascal (in the photo here with Simon and me) have been fabulous hosts and they have made our stay so comfortable that we really thought of setting up shop here permanently, me as their house cleaner and Simon… well we were not quite sure what he would do. But Berlin is calling and we must move on. Also Wendelin is thinking of visiting Australia so it is important that we get home and get a place so he has some where to stay – only criteria, must have a hot tub! (he is very fussy). We really do hope that he comes so that you can all meet him and we can return the Swiss hospitality. 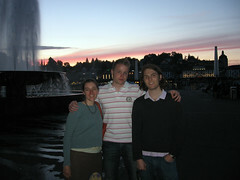 Thanks again guys for a great time in Lucerne!